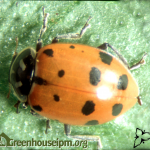 There are many species of lady beetles that prey on aphids, the two-spotted ladybird, Adalia bipunctata, and the Convergent lady beetle, Hippodamia convergens, are the most common species that are available through biocontrol suppliers in Canada. 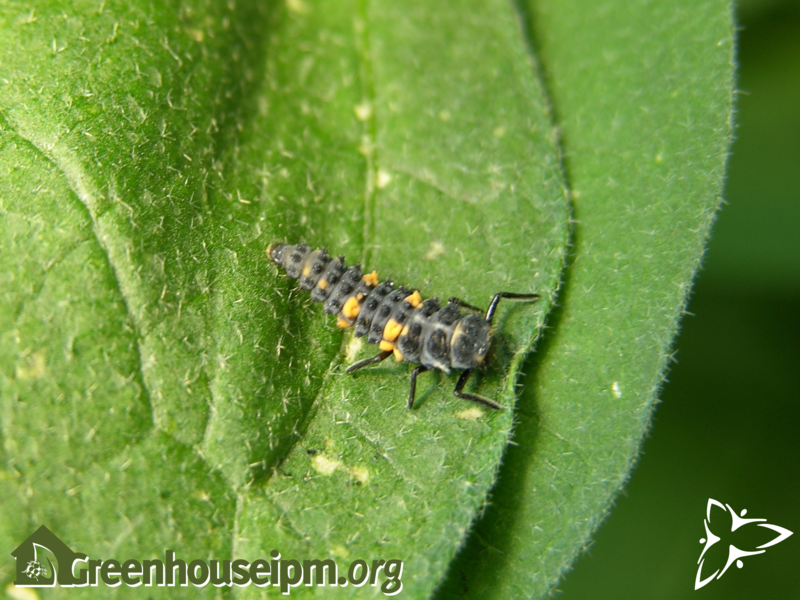 Both adults and larvae are voracious predators of aphids, each capable of consuming up to 100 aphids per day. They are therefore useful for cleaning up hotspots. Lady beetles are small, round to oval, shiny, dome-shaped beetles. Their larvae are oblong, rough-textured, and grey-black with yellow-orange spots or stripes. Hippodamia convergens adults are very common in North America, and fit our common idea of what a lady beetle should look like. They are orange to red in colour with several black spots, and are about 7-8mm long. Adalia bipunctata are similar in size, and they are either red with 2 black dots, or black with red dots. 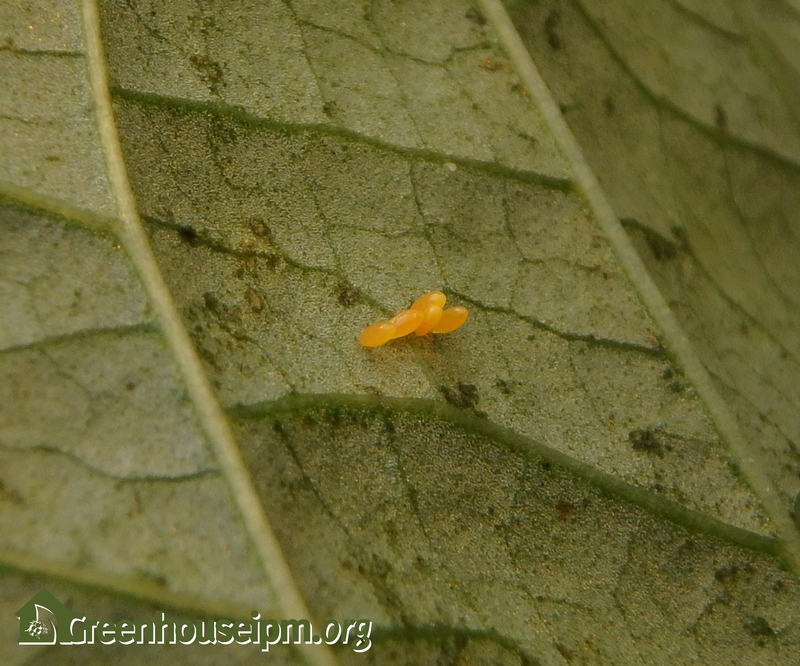 Lady beetles lay yellow-orange oval eggs in clusters on plants near prey sources. The eggs hatch into larvae, that will continuously feed through 4 larval stages. While their main prey is aphids, they will opportunistically feed on other soft-bodied insects they encounter. 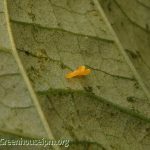 They will stop eating to pupate; the pupae look like a smoother version of the larvae, with more orange-yellow spots, and is inactive during this stage. The adults will then emerge and continue feeding throughout their adult life that can last 2-3 months. The total life cycle of Adalia bipunctata and Hippodamia convergens from egg to adult takes approximately 3-4 weeks at 20°C. 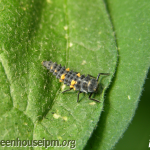 Lady beetles work best when aphid numbers are higher, and should be introduced into hotspots. 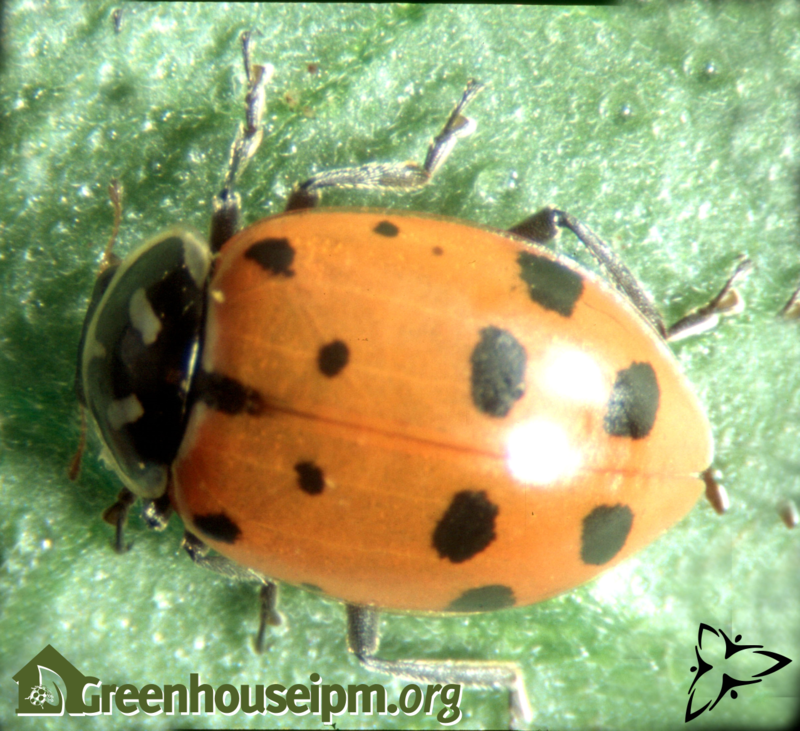 Refer to the Quality Assurance of Biocontrol Products guide to determine the quality of the lady beetles at receipt at the greenhouse. Lady beetles tolerate a wide range of conditions, and are active from 13-35°C and 30-90% humidity. Please consult the Quick Reference Guide to Registered Pesticides made by OMAFRA for compatibility information of products registered in Canada. Koppert and Biobest also have pesticide compatibility information listed on their websites.